First and foremost people, the O))) is silent. It isn't Sunn-Oh, it is pronounced just Sunn...just like the amps they are named after. I am amazed at how many self proclaimed music "experts" get this wrong. The parallels between heavy metal and classical music is not a new subject and there are a multitude of little mentions of it in various books and articles. Among many metal enthusiasts, myself included, there has always been a love for classical music and as the genre of metal branches out into thousands of shards of sub-genres, the connection between the two is overlapping more than ever. I will spare you the dissertation of what metal and especially contemporary classical music share, but at each of their core there is an undeniable share and share alike of atonal explorations, complex rhythms, dissonant tones, meditative, contain thunderous climaxes, unsettling textures, use of choral groups....the list goes on and on. As an adult I have fallen in love with more and more avant-classical (IE Ligeti, Stockhausen, Penderecki) and with that has come an ongoing love affair with the more out there black metal, doom, and ambient / atmospheric metal. They fall under the same category for me and once my ears arrived at an appreciation for one or two artists, the rest came with it shortly after. There are a ridiculous number of bands out there experimenting with song structures seeped in classical influence but there are leaders within this group and Sunno))) is at the head of the class. Monoliths & Dimensions is their 7th studio album and it is the groups most stunning, most gorgeous release to date. Two years in the making, there are additions to the Sunno))) line up here which helped magnify their already epic use of feedback and low tones. Eyvind Klang, Oren Ambarchi, Attila, Dylan Carlson, Julian Priester, and Stuart Dempster are among the key players and for good measure there are also horns, harp, flute, strings, and a Viennese woman's choir. What I find so completely explosive and inspiring about this entire body of music is how all the pieces fit together and compliment one another to produce a very cohesive final product. Often when bands add new instruments and layers they battle one another in an awkward way so instead of all of the elements coming together, they create an ugly soupy mess. As heavy and punishing as this record can be at times, there is still a delicate, clean, light air to it. Sunno))) has produced a glorious all encompassing fog rather than a smoggy choke inducing haze so many other bands in their genre wheeze out. 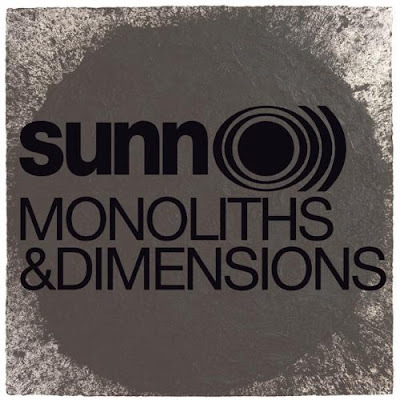 Monoliths & Dimensions are Sunno))) at their very best and it is exciting to have a band not only adventure out to sculpt their craft into a new aural shape, but use these new tools to perfection and in perfect harmony with their trademark sound. Few bands have the opportunity to record with a sky is the limit mentality and I am thrilled that Sunno))) used their fortunate position to create the ultimate gift for the fans who helped bring them to this place. We all win.